'All About Presentations' by Jazz Factory: How to cheat with PowerPoint? 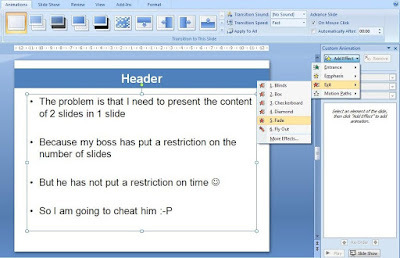 How to cheat with PowerPoint? Arvind, a sales manager, has to make a 20 minute presentation in his office and his boss has put a upper cap of 5 slides. Arvind does not feel that he can put all the content in just 5 slides. What should he do? How can he put 10 slides' matter into 5? How can he circumvent the law without breaking it? This was the question I had asked in my May 14 post. A reader Riz Mathani had also given a good reply. In today's post I present one more solution to this problem. How do you cheat with PowerPoint and present the matter of two slides in one? The answer is actually very simple. Use animation. Step - 1 Create the first slide in the normal way. Then animate the placeholder (body). You need to do this otherwise each bullet point will fade one after the other. Step - 2 Copy the second slides text onto the first slide. Then animate the placeholder (body). Result: In slideshow mode, content of slide 1 comes first. On a mouse click, the content fades and on another click slide 2's content appears. You might never have to use it this way, putting content of two slides onto one. 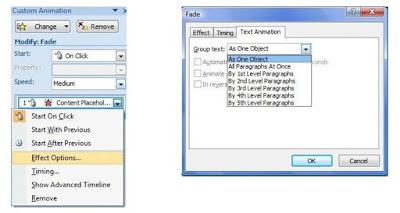 But knowing how to animate text, make them appear disappear helps you do a lot of tricks with PowerPoint. In what all situations would you like to try out this trick? Leave a comment.